Maximus Clarke’s 3DOLATRY images represent the emergence of a distinctive approach to 3D portraiture, shaped by the influence of expressionist cinema, and the era of black-and-white screen idols. The 3DOLATRY series addresses the artist’s central preoccupation with the formation of the individual self in a world of technological alienation and visual overload. The portrait subjects exude a sense of mystery; they seem close enough to touch, yet they keep their secrets. 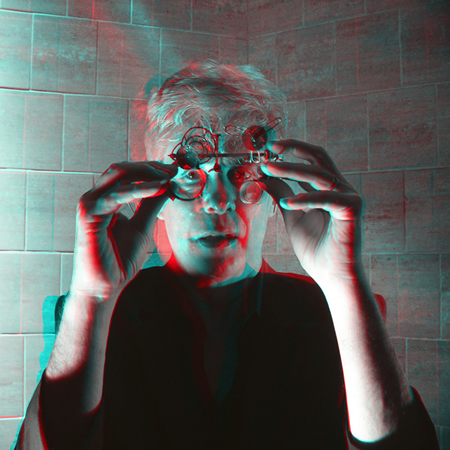 All the subjects are wearing glasses of some kind, suggesting vision mediated by technical devices, and reflecting the experience of the viewer donning 3D glasses to encounter the image. The 3D format itself is both a revelation of reality and a contrivance. Along with each portrait, Clarke created a matching deconstructed image, in which the 3D effects are deliberately miscalibrated and impossible to visually interpret. The deconstructions gesture toward the complexity of stereo vision, and the artifice of stereoscopic 3D. The complete 3DOLATRY series was first exhibited at Devotion Gallery in Williamsburg, Brooklyn, in 2011. Enlarged versions of the 3DOLATRY portraits are on view at the inaugural edition of the Portal Art Fair, May 4-10, 2016, at Federal Hall in downtown Manhattan.